...it was a 'normal' day until shocking news came that Nigel L-95 was dead. ...sorry to have to say it that way, but that's what it is - shocking. 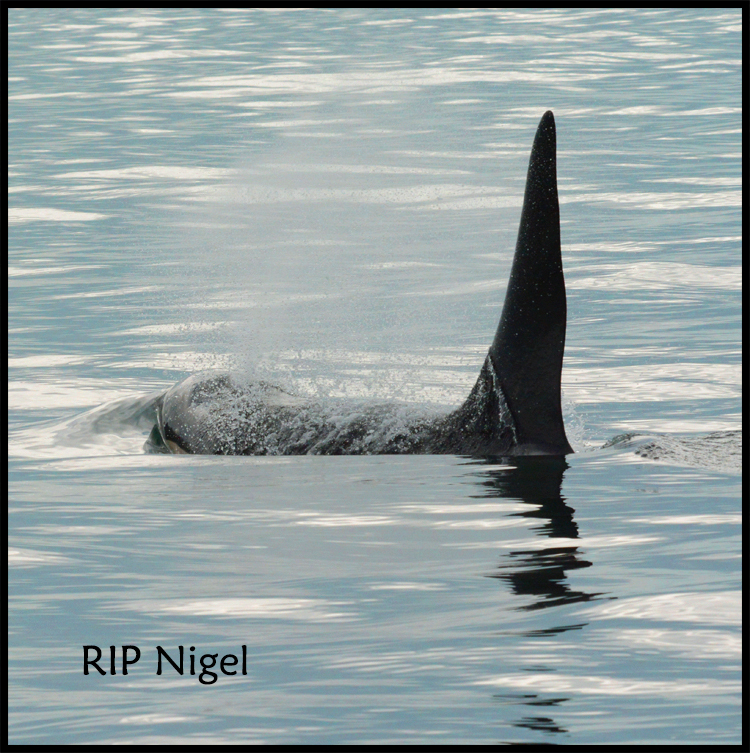 ...originally the adult male orca found on March 30th off the outer coast of Vancouver Island was initially thought to be a Northern Resident...but it was Nigel. "A male killer whale was found floating dead near Esperanza Inlet, B.C. on March 30th, 2016. A necropsy was performed on April 1st, 2016, to determine the cause of the animal’s death. This animal was identified as L95, an approximately 20 year old Southern Resident killer whale, via a scar from a satellite tag deployed on the whale by the US National Oceanic and Atmospheric Administration (NOAA) in February 2016. The Southern Resident population is listed as endangered under the Species at Risk Act in Canada. tag implant site at the base of the dorsal fin. Gross dissection and X-rays of the tag site indicated that the tag petals were left behind when the tag detached, but revealed no apparent localized or tracking inflammation. perforation of the caudal abdomen (near the posterior end) and herniated loops of intestine attributed to decomposition and bloat. DFO can also confirm that the dead killer whale calf found near Sooke, BC on March 23rd, 2016 has been ID’d by the Vancouver Aquarium genetics team as a southern resident. The female calf was less than 2 weeks of age and had not yet been categorized. Further analysis will be done to determine which pod the calf belonged to. A necropsy was performed on March 25th, 2016. The initial/gross necropsy results did not indicate a cause of death, but given the young age of the animal, a birthing complication is suspected. Analysis of tissue and blood samples is underway for both animals, and results will be provided to DFO in the final necropsy reports in 3-4 weeks. The results of these necropsies will feed into a growing body of knowledge to assist in assessing the threats to Southern Resident killer whales from a population health perspective. This data allows us to look at trends, pathogens, or other indicators that may affect their life histories. Fisheries and Oceans Canada would like to acknowledge the efforts and collaboration from the BC Ministry of Agriculture (and in particular, Drs Stephen Raverty and Heindrich Snyman, Veterinary Pathologists who performed the necropsy exams), Vancouver Aquarium staff for their DNA sequencing, the US National Oceanic and Atmospheric Administration (NOAA), not to mention numerous dedicated DFO staff and biologists." 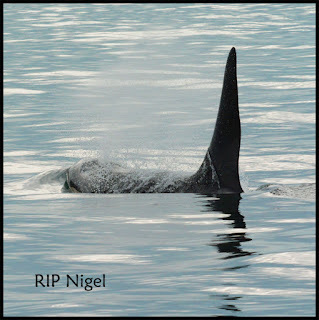 ...Nigel L-95 still had metal in him from the satellite tag that had been 'shot' into him earlier in the year...read what the head of the Center for Whale Research, Ken Balcomb stated: here's the link. ...it's so basic - they need food - salmon. Why are the dams not being breached to provide food for the whales...ways you can help...here's the link. but they can thrive by eating salmon. Isn't it possible to do both at the same time? Let the whales eat while the studies go on. learn more in the process.